Are you the Beauty to his Beast? 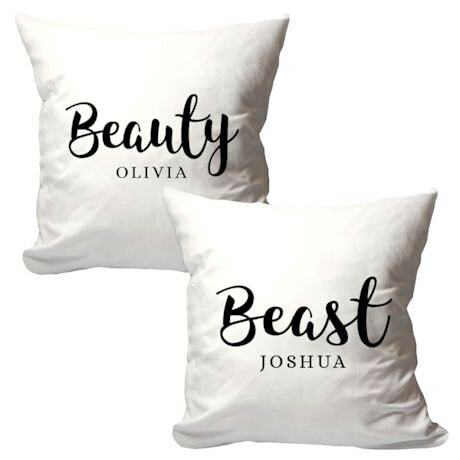 The perfect pillows for the perfect pair! Simple yet impactful, personalize this pair of pillows with a name for each. Great as a gift for newlyweds, Valentine's Day, or anniversary. Set of 2 white pillows, black ink. Specify names, 20 characters for each. Machine washable, suede-like 100% polyester. Each generously sized at 18" x 18". Includes inserts. Allow 3 weeks. No rush delivery or gift box.